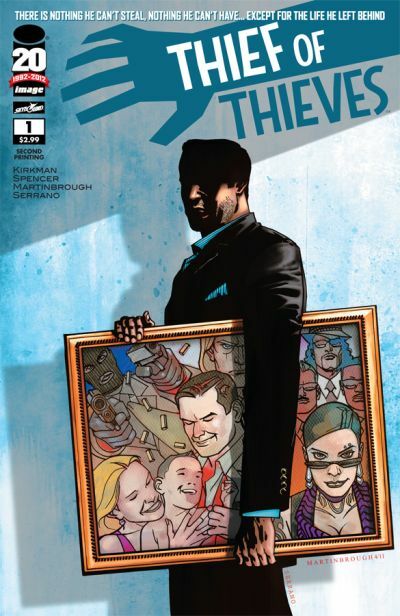 Continuing a trend for Image Comics in 2012, THIEF OF THIEVES #1, the first issue of a new series by Robert Kirkman (THE WALKING DEAD), Nick Spencer (MORNING GLORIES), and Shawn Martinbrough has sold out. The issue has immediately gone back to press and a second printing (DEC118235), with a new cover by Martinbrough, will be in stores on the same day as THIEF OF THIEVES #2, March 14. The story of a master thief who gives up a luxurious and thrilling life of crime to try to salvage everything he lost—his family and a life above ground—by leaving it all behind, THIEF OF THIEVES launched on February 8. Prior to sale, there was wide interest in Kirkman bringing a television-style writing process to comics. A team of writers helps to refine the story of THIEF OF THIEVES, with Kirkman at the helm to guide the story. Like all Image Comics titles, THIEF OF THIEVES #1 is available on a variety of electronic platforms as well as in comic book stores.